A couple of weeks back, as Anthony Weiner rose to the front page of the Drudge Report on a daily basis, I considered his story too soft to bother writing about. I now find him to be a potent, if unwitting, monument to the merits of anarchy. Weiner's story is a pointed example of the ridiculousness and utter phallaciousness of electoral politics and the dangerously irrational personalities that thrust themselves into it. It reminds us that rule by majority, rather than organization by consent, arouses the wurst in humanity. The nimrods who would rule us are almost always more interested, not in servicing "we the people", but in giving us the shaft. Libertarians know authoritarian and criminal/amoral tendencies to be one and the same. Almost completely without fail, charts of these ethically-compromised personalities will indicate a compromised Pallas placement. The Weiner chart does not disappoint in this regard: it exhibits a nasty Jupiter-Pallas opposition (see this for examples, with dozens more here) and Pluto quincunx Pallas on top of that. The latter may be mitigated by the Sun with Pluto -- slightly. The Jupiter opposition is almost a guarantee of bad behavior when it shows up on the chart of a politician. We might see more signs if we had a time of birth, but the South Node quincunx Venus is enough to put the Weiner chart on the economic Left. Of course, Venus isn't just the perception of property and wealth: she represents women. With the South Node connection to Venus on top of the completely blocked Pallas, we get not only someone with a very weak conception of property rights, but also someone who can't recognize the boundaries of the women around him. (We'll consider Bill Clinton's Venus-Neptune conjunction in a future installment). Hard-authoritarianism (and/or criminality) plus Leftist economics isn't enough to give us a Democrat or an open Leftist. We look to the Moon to complete the picture. 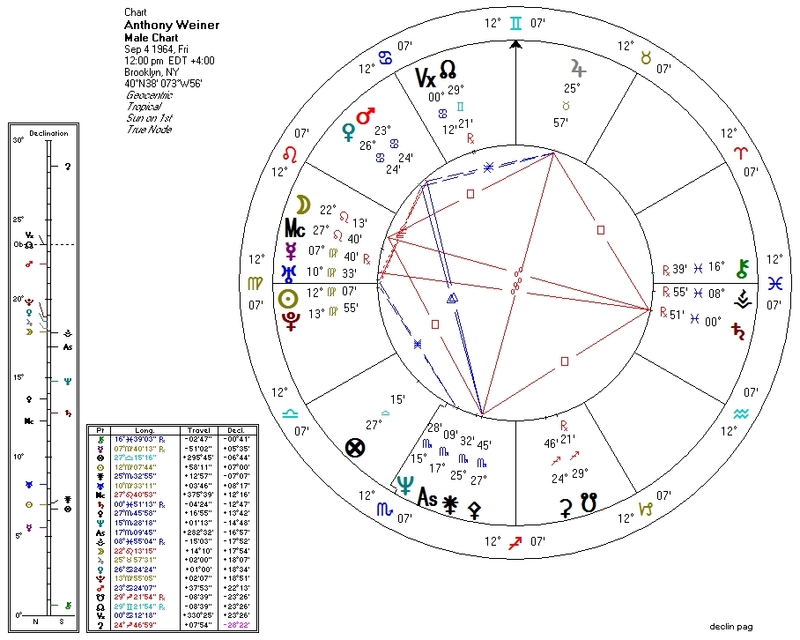 Were the Moon or her ruler, or the Fourth House or its ruler implicated with the North Node, we might have the chart of a neoconservative Republican. Weiner, however, has the ruler of the Moon (the Sun) sextile Neptune regardless of time of birth. On top of this, there is a high probability that the Moon herself is within orb for a trine with the South Node. Not a conservative. Not only do we have a leftist hard-authoritarian chart, but Pluto conjunct Sun (ruler of the Moon) and parallel Venus completes the bloodbath formula, present in the charts of mass-murderers both of the political and non-political variety. The vast majority of persons with charts fulfilling the formula never kill anyone: the vast majority of charts of mass-murderers in my studies do nevertheless carry the formula. It is often the power of high political office that allows the evil potential of the pattern to come to expression. It is probably for the best that Weiner's charisma probably cannot overcome his penile peccadilloes in the public eye. Were he to rise to high office, we might find his penchant for "sexting" to expand to much larger offenses. As for Weiner's compulsive exhibitionist tendencies, I don't think it's a stretch to point out the Sun-Uranus-Pluto conjunction, semisquare both Mars and Venus (with the ethical considerations removed by aforementioned factors against Pallas and Venus). You may use your imagination here. I, for one, will be trying to put it out of my mind.